Let’s hope by now that the big snows have passed. It really seems like every winter gets weirder than the last, and by now it seems like we’re just as likely to have 80 degree days as 40 degree ones. If it’s not raining, if the wind isn’t whipping, it’s probably time to go up on the roof and take a look at the antenna. Those things are pretty tough, but they don’t last forever. The most important thing you want to check is that any wire connections still look good. You shouldn’t see corrosion on anything and none of the connections should be loose. If there is a plastic box mounted to the antenna, check to make sure water didn’t get in there. If it did, you could have a big mess on your hands. It’s also important to check that all the antenna elements are in good condition. Bent elements won’t perform as well as nice straight ones. You may be able to bend something back if you try gently, but an element that’s bent too far will never get back to its original shape. At that point you’ll have to decide if the antenna’s performance has been impacted. Finally, make sure the antenna itself hasn’t come loose from the mast. This is very common as metals shrink and grow in different temperatures. 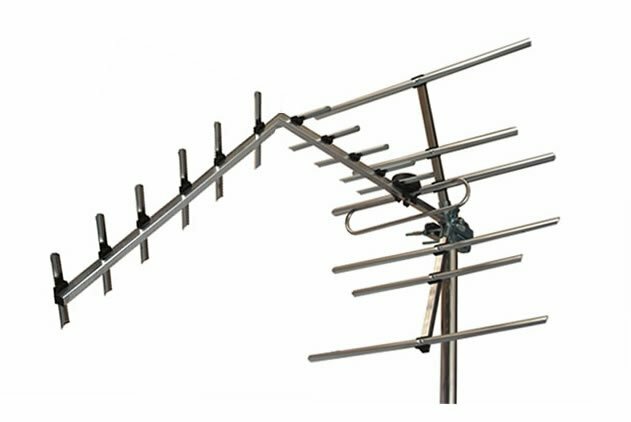 While the antenna may have made it through the weather fine this year, you may have different results next year unless it’s tightly mounted. Don’t forget to make sure that all grounding wires are still intact and that they are connected to the antenna or ground block on one side, and to a source of ground (a water pipe, the actual earth, or a home electrical ground) on the other side. If your antenna isn’t in tip-top condition, you have some hard decisions to make. Is it time to replace it? Is there anything you can do? Generally by the time you start to see obvious signs of physical damage, it’s too late. Delicate circuits could be damaged or even destroyed. The antenna itself may not be able to perform as well as it did in the past. If you have a good antenna meter, see if you’re still getting good readings on every channel you care about. It doesn’t matter if you use one built into the TV or if you have a standalone one. Ideally you would want to try on a windy or rainy day, because reception will be at its worst on that kind of day. If the antenna’s still holding up, you may be able to keep it another year. However, an antenna with visible damage is really just a ticking time bomb. I wish I could say it was easy. Things are changing fast in the world of broadcast TV, and it’s practically impossible for a homeowner to know what to buy. Even those web pages that try to recommend something can’t keep up. Channels are moving positions all over the country and the problem will continue for another year at least. The solution is simple. Solid Signal offers a free service where a real, qualified technician will look at your location. You’ll get a recommendation for an antenna that takes into account everything about your situation, even your ability to go on the roof and mount it. And of course our techs will recommend something from our vast selection of outdoor antennas, as well as all the hardware you’ll need for mounting. Get started now!